The ADTMWSG7 rolling iPad workstation is a versatile multi-device solution for the home or office. Simply attach your tablet to the universally compatible, extendable arm, and adjust it to the desired location. The rolling iPad workstation is ideal for business or hospital use, where tablet applications are used alongside conventional computers. With a strong, polypropylene wishbone shaped base supported by locking casters, there is no need to worry about durability in a busy environment. Play the video to see this workstation's features in action! SAMANTHA (Narrator): "This rolling ipad workstation is a great choice for home office or business settings. Made from sturdy ABS plastic with a strong polyprolylene base, this mobile desk’s table top surface is height adjustable so this desk can be used sitting or standing. A universally compatible tablet holder is attached to the desktop via a height adjustable and extendable arm. The wishbone shaped base sits atop 3 rolling casters making it great for lateral portability. The casters also lock to keep the unit in place. A retractable mouse and cup holder are attached to the underside of the tabletop and can be swapped out for right or left handed users. 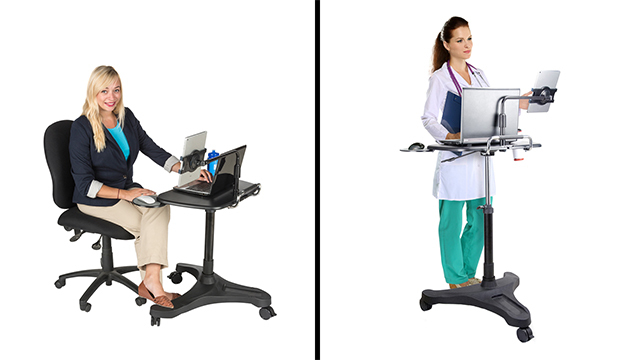 Perfect for home offices, hospitals or business environments, this rolling ipad workstation is accommodating for workflows that require sitting, standing or both."